There are about 10,000 baby boomers turning 65 every day and study after study continues to show the health benefits of exercise no matter one’s age. According to the National Institutes of Health, regular exercise can help delay or even prevent the onset of diseases, and is also beneficial for chronic conditions such as arthritis, heart disease and diabetes. It’s the tennis shoes that give them away. 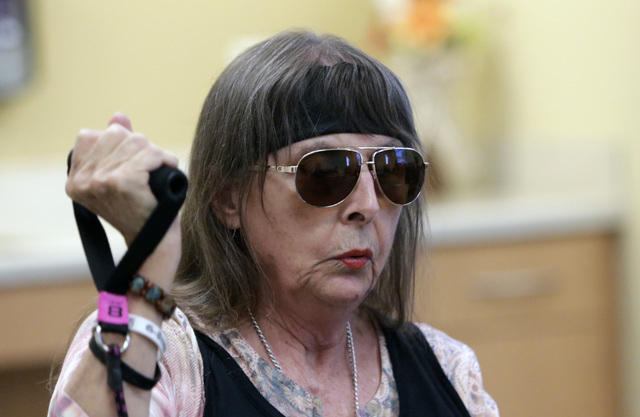 Inside the Southwest Medical Associates Lifestyle Center on South Eastern Avenue, there are about a dozen women lined up in rows of three or four, a patchwork of T-shirts and cropped jeans, hoop earrings, flowy blouses and the occasional dab of lipstick. But it’s the feet, snug in canvas and cushy soles, that mean business. For the next hour, the women, most of them in their 70s or 80s, march in place and bend their arms into bicep curls. They do standing pushups against the walls in perfect form and dip down into shallow lunges while holding the backs of chairs. At one point, the instructor even has them play a memory game, asking them to recite the names of animals they remember from a list he had written on a white board, showed them at the beginning of the class, then covered up. 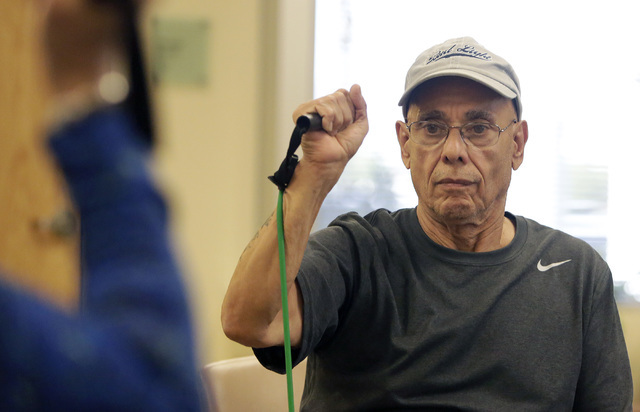 It is all part of a weekly exercise session open to the public called ForeverFit, one of a handful of offerings at the lifestyle center geared toward improving the fitness of older adults. Similar programs are available across the valley, some of them open to the public, others as part of Medicare Advantage or supplement plans. But whatever the source, they make sense. About 10,000 baby boomers turn 65 every day, and studies continue to show the health benefits of exercise no matter one’s age. According to the National Institutes of Health, regular exercise can help delay or even prevent the onset of diseases, and is beneficial for chronic conditions such as arthritis, heart disease and diabetes. Another key benefit is fall and injury prevention. In other words, exercise helps keep those ligaments and tendons flexible and bones strong, improving balance. 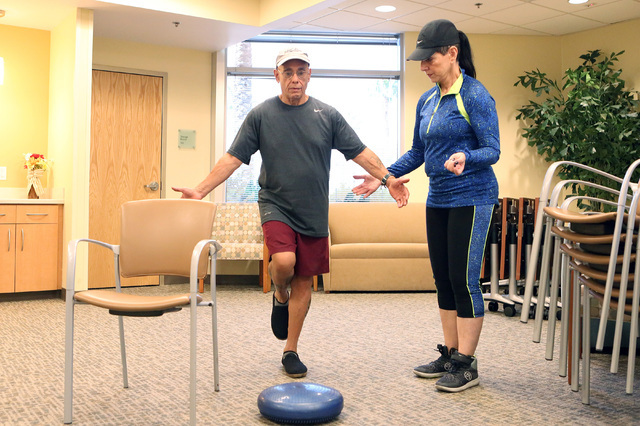 “There are multiple medical studies that show the advantages of physical activities as we get older and the first one being, it’s never too late to get started,” said Dr. Samuel Bauzon, medical director of the valley’s two SMA lifestyle centers. One of the most well-known programs is called SilverSneakers. 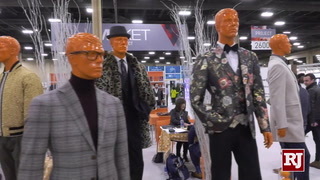 It’s offered across the country through Medicare Advantage, Medicare supplement and retiree programs, according to Joy Powell, chief operating officer of Network Solutions, which oversees the program. 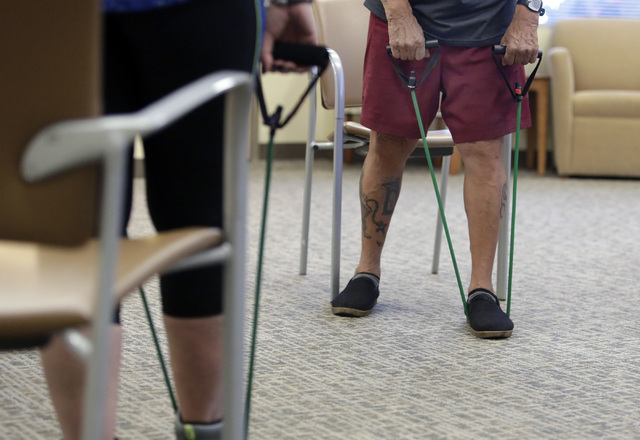 About 80,000 people in Las Vegas qualify for SilverSneakers, which provides access to several of the valley’s fitness centers, such as 24 Hour Fitness, Curves and local YMCAs. Participants also have access to SilverSneakers classes tailored to the needs of older adults. Depending on the location, the classes can include everything from aerobics cardio-fitness programs to line dancing and yoga. In some cases, the services of experts are offered. The YMCA on Meadows Lane, for example, provides access to a health coach. 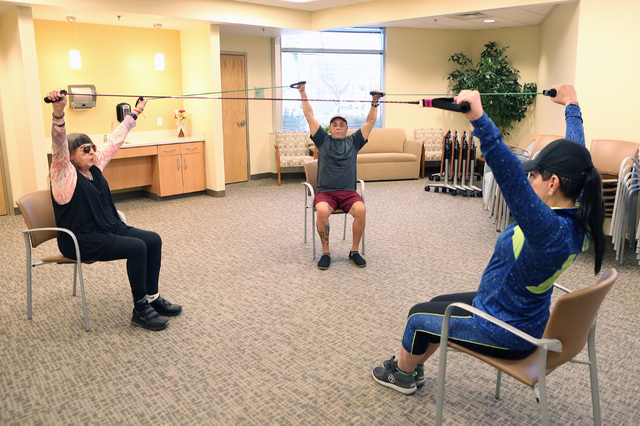 Powell added that the program recently rolled out a series of 30-minute classes targeted toward baby boomers, including a cardio class called Boom Move It, and Boom Mind, which is a combination of Pilates, Tai Chi and stretching. Boom classes “are a more intense program, and it really appeals to the people who have been exercising all their life or are really conditioned,” she said. 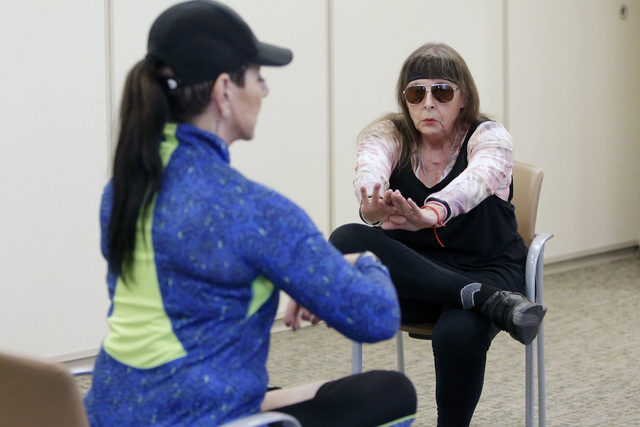 Bertha Shinn, who is 74, has been taking classes at the Humana Guidance Center on West Charleston Boulevard for the past several months, including SilverSneakers CardioFit, as well as classes offered to the public such as ballroom dance. She has been a diabetic for 26 years and the classes, along with a routine of walking and riding a stationary bike, have helped her lose weight and reduce medications, she said. Her final goal is to get off cholesterol medication and insulin, which she predicts will happen soon. Shinn noted that taking classes at the center has also improved her balance, and one class in particular taught her the correct way to get up after a fall, “and I needed that desperately,” she said. “The teachers are so excellent, so patient … and you also get to socialize. You need that. You need to encourage one another and you need to see what other people are going through so that it can help you get over whatever problem you have,” she added. Senior Dimensions Southern Nevada participants are able to take part in SilverSneakers and another program called the Fit for Life Club, which allows unlimited access to nearly 30 recreation centers/pool facilities across the valley and the four YMCA’s in Las Vegas, including fitness classes offered to the public. 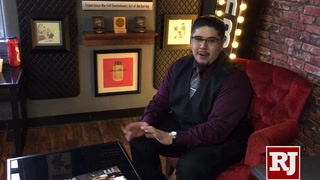 Often, the staff can direct participants to classes that best suit their needs and abilities, and even tailor a program for them, Bauzon said. While physical fitness is key to good health, Bauzon also emphasized that the companionship provided in these programs is equally important, including reducing the mental health risks associated with isolation such as depression. 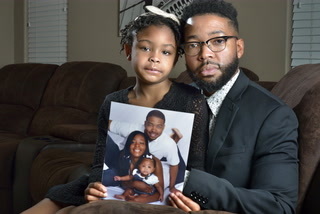 “When you think about it, when they retire they no longer have their friends at work, they may have lost a spouse, their families have moved away and started to grow up,” he said. After the ForeverFit class, a few women stay behind to talk about why they keep coming back. Alida Allen, who is 75, said it has helped keep her energy up, and muscles loose and strong. Beverly, who is 83 and also has the last name Allen, added that the exercises have helped reduce a lightheadedness she experiences now and then, and has been a way for her to get out of the house and get moving. Without missing a beat, Alida adds her own perspective. 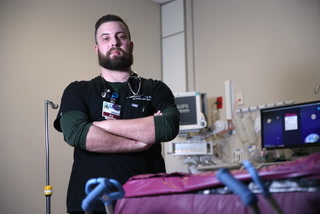 “And if you’re feeling depressed, which we feel, especially when you get up in the morning, ‘Oh God,’ you know, we come here and I always feel great afterwards,” Alida said. “Yeah, me too,” Beverly agreed.